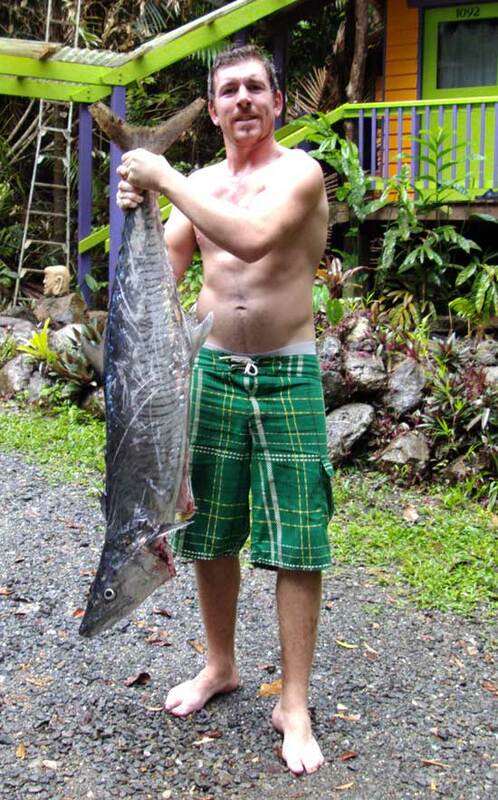 Australia has some pretty amazing fishing and some tourists can't believe the size of the fish that are being pulled up. 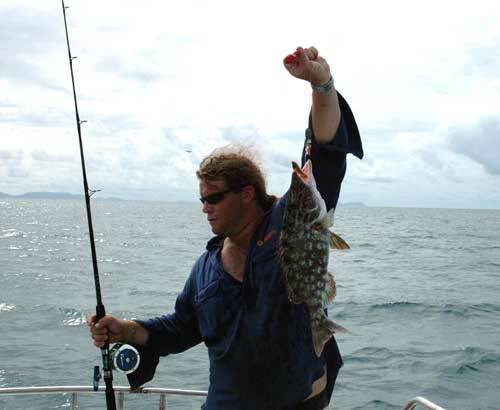 For many their holidays would be a failure without at least one big barramundi, marlin or coral trout. 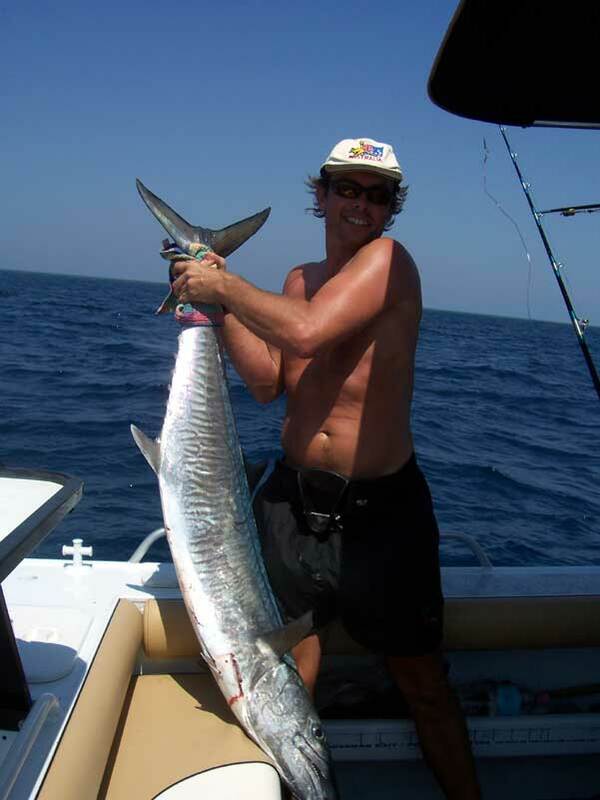 Off the coast of north Queensland marlins up to 500 kilos are caught! if you're in the fishing business contact us to advertise on this page! 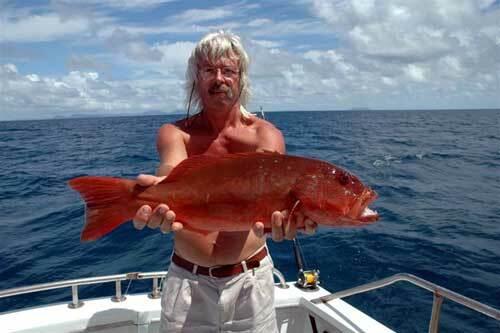 Here's Rob looking very pleased with today's catch. 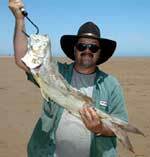 And Simon looks pretty happy with his barra too! The Legend has struck again! 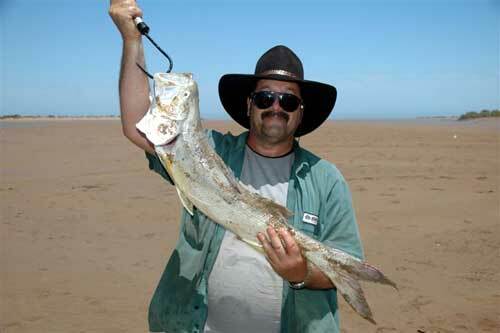 caught off Port Hedland W.A. 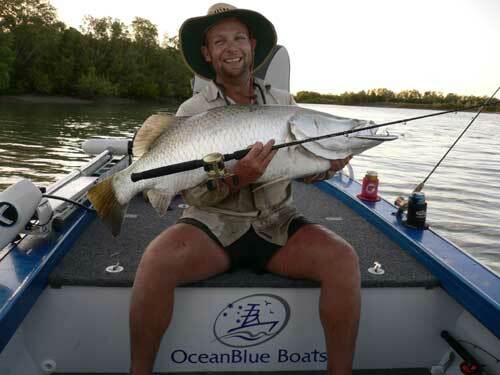 Book on a fishing charter and catch one of those big Queensland fish! Phone Justin on 0414 185534 for more information. Robbie, send us some pics! Gold Coast bloke Robbie Hughes at Varsity Lakes apartments on Lake Orr doesn't need a boat to go fishing. He lives on the 6th floor of an apartment building above a lake and fishes from his balcony ! 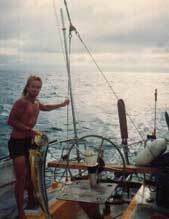 With the help of his mate David he has caught at least 12 bull sharks up to two metres in length, while another 100 or so have gotten away. It requires some team work, Robbie casts the line from the balcony and when he's got one hooked Dave grabs the gaff and zooms down in the lift to the bottom car park to help pull in the catch. Gold Coast canals are notorious for bull sharks, two swimmers were killed here in 2002. 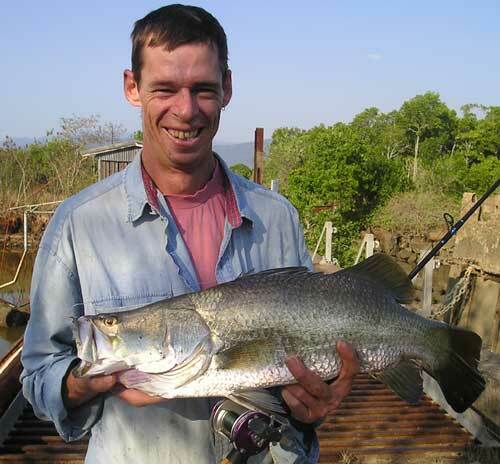 The world's largest recorded barramundi was caught by Dave Powell in Lake Tinaroo in September 1999. 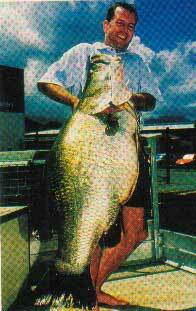 This ginormous whopper of a fish measured 124 centimetres and weighed 38.75 kg. 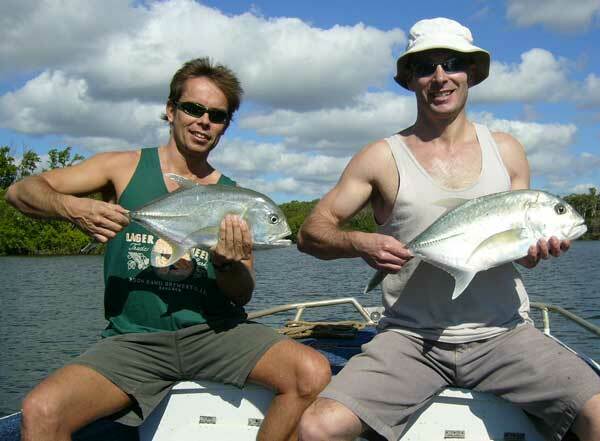 Lake Tinaroo is located in the Atherton Tablelands behind Cairns and is three quarters the size of Sydney Harbour and some believe that there are even bigger barra than the one pictured to the right still swimming around in this lake. 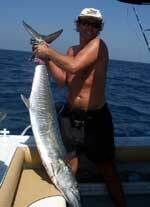 You can try your luck with one of the local fishing charter boats. 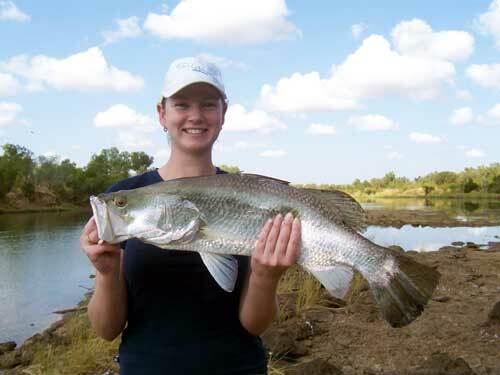 Every year around March, for nearly 30 years now , they hold the World Barramundi Fishing Competition in the outback town of Burketown in western Queensland. 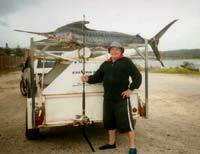 In March 2010 Tony Bambino from Mutchilba, Qld. made the news with a 30 kg. 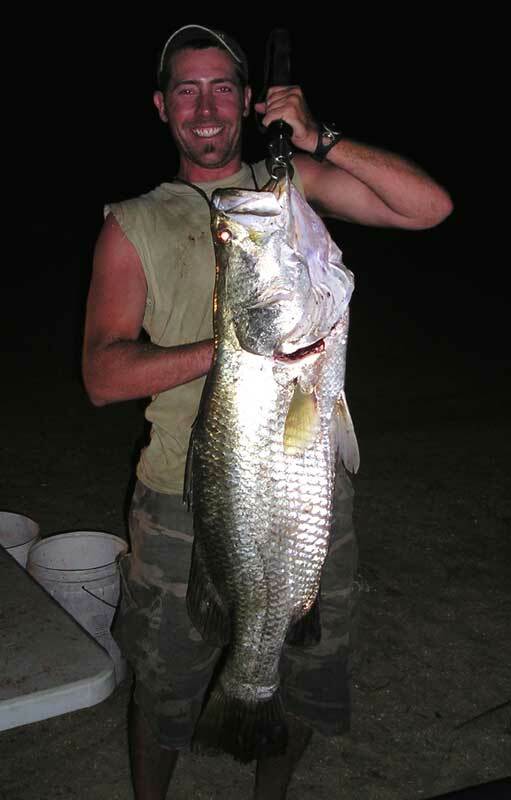 barramundi that he caught without any fishing gear! 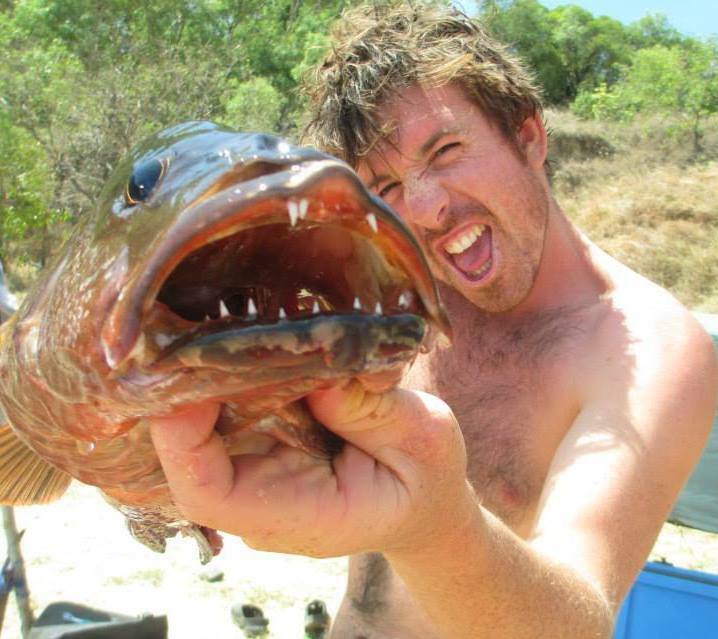 He was driving past the river late arvo and saw something shiny in the water, he jumped out of his car and grabbed the big fish by the mouth. It took more than ten minutes of hard work to drag it out of the water but he got it ! In Cooktown, north Queensland there is some very good fishing to be done as you can see on the pics above. 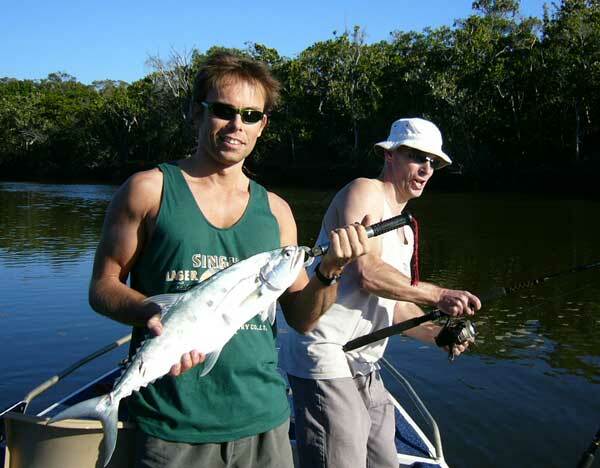 Go fishing when you're staying in the Daintree/Cape Tribulation area; there's a few fishing boats available to charter on the Daintree river, or you can rent your own boat. The boats come and go a bit so we can't keep up to date info here but first find yourself some accommodation in the Daintree and your host will find you a boat then. Are you in the fishing business in Victoria? Contact us! Bare hand barra fishing! 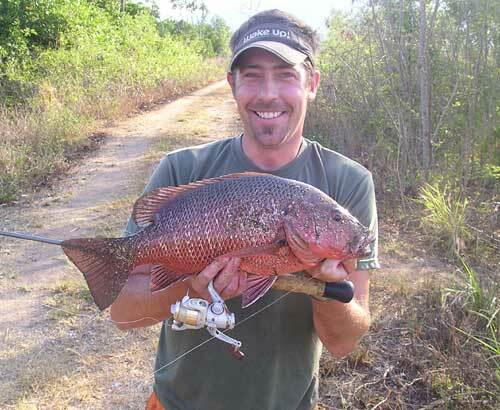 Some of the most amazing fishing I have ever seen was in Mataranka, Northern Territory, where a bloke catches barramundi with his bare hands. He will stand in the water holding a bit of bait and when the barra goes for it he will shove his hand up its mouth ( making use of the fact barra don't have teeth) and lift him out of the water. 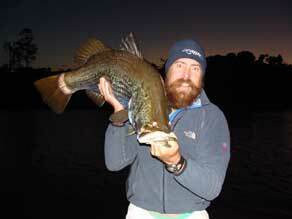 Paul Kaine, the owner and principle guide for Paul Kaine's Guided Fishing Tasmania. With his family he resides in Tasmania's Central Highland lake country where he conducts specialised guided trout fishing adventures. 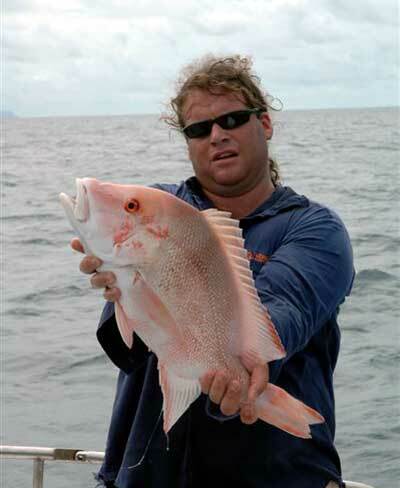 More info on his website guidedfishingtasmania.com.au or send him an email . Are you in the fishing business in Western Australia? Contact us! S.A. 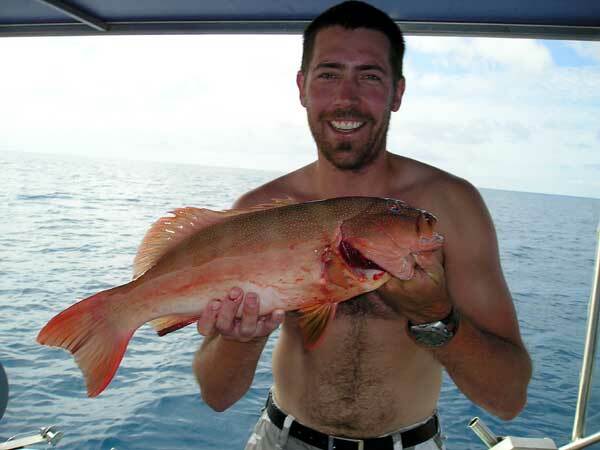 Fishing News is a website where you will find all the information you need to become a successfull fisherperson, the latest tide times, weatherforecasts and fishing hot spots, fishing tips, pictures, size and bag limits and much more. 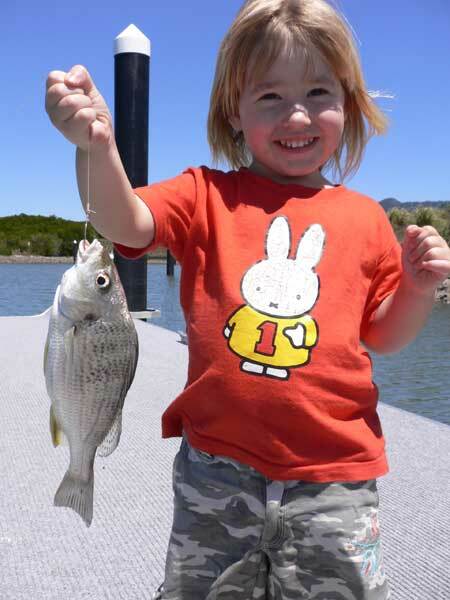 Are you in the fishing business in Canberra? Contact us! 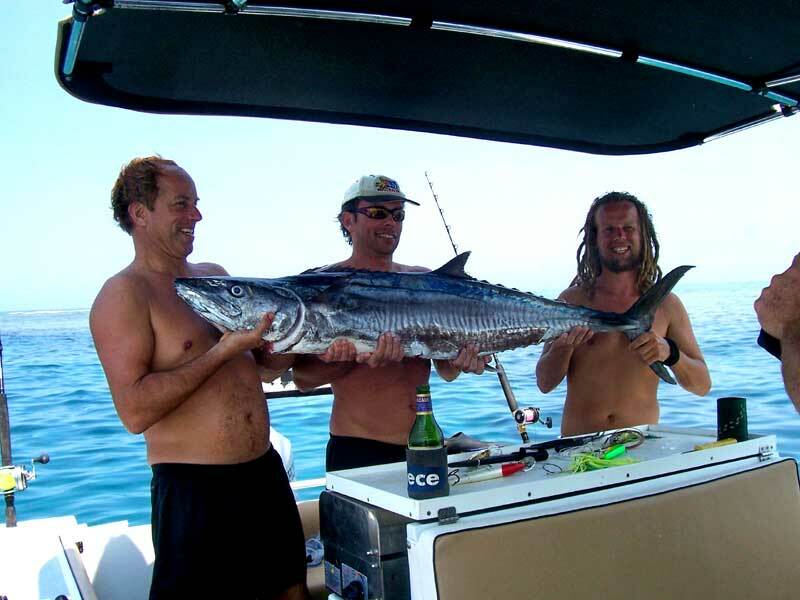 You know of, or did, any amazing Australian fishing? Then tell us! Ardent Cleaning Services Townsville - for all your industrial, commercial and domestic cleaning around Townsville.